We will be running our kids Kamp for 4 weeks again this year! 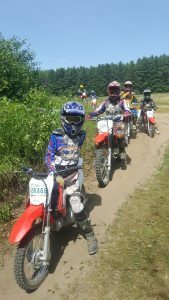 This is a day camp that offers dirt bike training, trail rides, and tons of other fun activities. Some options include radio controlled trophy truck racing from “Traxxas”, Tree Top Trekking, paintball etc. 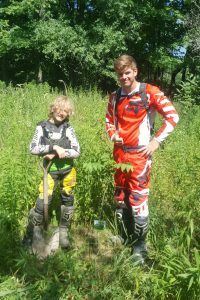 The kids learn how to take care of a dirt bike, environmental respect and sustainability, trail manners, how to prepare for a trip in the back country and some basic off road survival skills. The dirt bike, riding gear, trail pass, guide, instruction, lunch, snacks and drinks are provided. Email or call 705 875 2980 to book.